VANCOUVER, BC – April 28, 2016 - SilverCrest Metals Inc. (“SilverCrest” or the “Company”) is pleased to announce additional results from the underground channel sampling program and the commencement of a surface drilling program at its Las Chispas Project (“Las Chispas”) located in Sonora, Mexico, as previously announced on March 2, 2016. Las Chispas is in a prolific mining area with nearby precious metal producers. Historical reports indicate the presence of 14 veins in the district of which only three (Las Chispas, William Tell and Babicanora) have been previously mined extensively in the early 1900s, but none of which appear to have been drilled. All assays were completed by ALS Chemex in Hermosillo, Mexico and North Vancouver, BC. The initial geochemical signature at Las Chispas is Ag-Au-Sb-Ba-Mn-Ca indicating a low to intermediate sulphidation epithermal system. 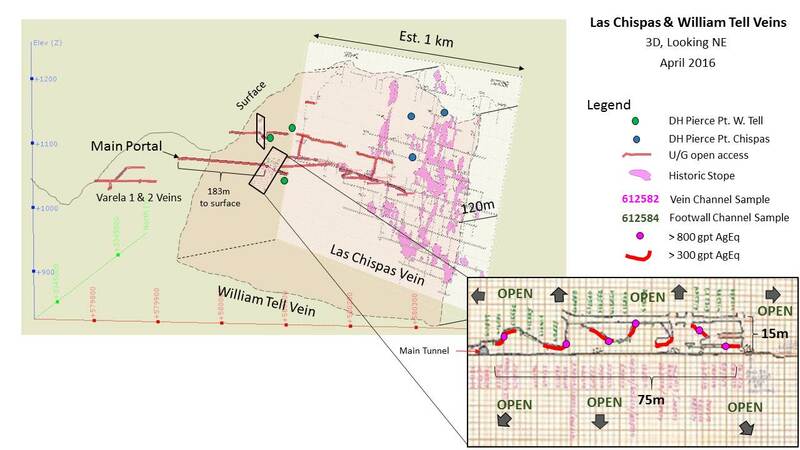 Initial geochemical test results suggest that the veins at Las Chispas may be similar to both nearby producing Santa Elena and Mercedes deposits. Concurrent with the underground rehabilitation, a surface drilling program of approximately 3,000 metres commenced in late March. To date, six holes have been completed for a total of 1,500 metres. This initial drill program is designed to test known mineralization, extensions of mineralization and the potential for new discoveries. All holes have intersected quartz stockwork and veining that are currently being logged and sampled. Upon receipt of assays, the results will be announced and integrated with the underground information. The Company has applied for a MIA (Environmental Impact Statement) for an underground drilling program of 2,000 metres to test potential near-surface resource areas and deeper extensional targets of below the historical workings. Minimal underground work is required to begin underground drilling. Depending on permitting, this program is expected to start in the second half of 2016. This permit also includes the extraction of a 100,000-tonne bulk sample for testing and processing off site. This news release contains “forward-looking statements” within the meaning of Canadian securities legislation. These include, without limitation, statements with respect to: the strategic plans, timing and expectations for the Company’s exploration, rehabilitation and drilling programs of the Las Chispas Project; information with respect to high grade areas and size of veins projected from underground sampling results; and the accessibility of future mining at the Las Chispas Project. Such forward‑looking statements or information are based on a number of assumptions, which may prove to be incorrect. Assumptions have been made regarding, among other things: the conditions in general economic and financial markets; availability of skilled labour; timing and amount of expenditures related to rehabilitation and drilling programs; and effects of regulation by governmental agencies. The actual results could differ materially from those anticipated in these forward-looking statements as a result of risk factors including: the timing and content of work programs; results of exploration activities; the interpretation of drilling results and other geological data; receipt, maintenance and security of permits and mineral property titles; environmental and other regulatory risks; project cost overruns or unanticipated costs and expenses; and general market and industry conditions. Forward-looking statements are based on the expectations and opinions of the Company’s management on the date the statements are made. The assumptions used in the preparation of such statements, although considered reasonable at the time of preparation, may prove to be imprecise and, as such, readers are cautioned not to place undue reliance on these forward-looking statements, which speak only as of the date the statements were made. The Company undertakes no obligation to update or revise any forward-looking statements included in this news release if these beliefs, estimates and opinions or other circumstances should change, except as otherwise required by applicable law.